Cambodian people have a deep respect for their parents, grandparents, and ancestors. Each year in September there is a ceremony called Pchum Ben “បុណ្យភ្ជុំបិណ្យ”, which combines the Khmer words “Pchum”, which means “to gather together”, and “Ben”, a “ball of food”. The ceremony takes 15 days and is a time when Cambodians honor their ancestors up to seven generations back. It is one of the most important holidays in the country. The first 14 days of Pchum Ben are called Dak Ben. During Dak Ben, people who live close to a pagoda take turns cooking food for the monks and the many visitors from other regions who come to the pagoda during this time. It is also believed that deceased relatives will wait at the pagoda for food made by their families. Before going to the pagoda children prepare lunch for their parents. Old people always say, “What you have at home is more powerful than the god in the pagoda. Who are the gods in your house? They are your parents.” Parents are precious gods for Cambodians because they give life, take care and worry about their children. What happens when we don’t respect our parents? That would be very rude and disrespectful. We can say that, if we bring happiness to our parents, we have happiness in our life and our children will respect and love us in the future also. ring Pchum Ben, Cambodian people visit at least three pagodas and the places where their ancestors passed away. 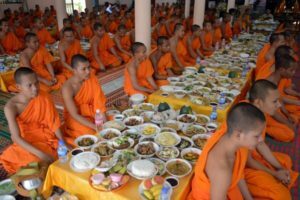 The time to bring food to Pagoda is not later than 11:00 a.m. because the monks will not eat after 12:00 p.m. After this time, the monks do not eat and drink only soft drinks or tea until the end of the day. Early in the morning, around 4:00 a.m., people prepare food, fruit and rice. They make small balls of food and go to the pagoda. There they throw the balls of food just outside the temple. It is believed that some of their ancestors, those who committed sins when they were alive, cannot enter the temples, even as ghosts. And they can only eat food that is prepared by their descendants. So this food is for them. 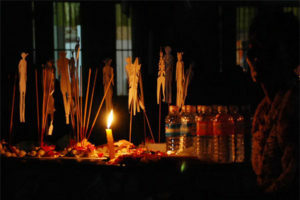 People believe that if these spirits don’t see their relatives bringing food for them, they will get angry and wish their relative bad luck. The 15th day is the most important day of Pchum Ben and also the last day of the ceremony. Cambodian people have three days for public holidays in October to have chance to visit their hometowns and gather with their family. Besides going to a pagoda, they usually have a quick visit somewhere nearby with family and have meals together. Pchum Ben is a traditional ceremony to remind people to bring the food to the monks. 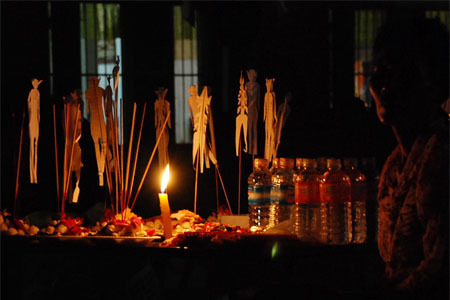 Moreover, the festival reminds people to remember their ancestors who have passed away. They always go to the pagoda on their ancestor’s anniversary or someone’s birthday. This is the way to showing high respect even on days that are not the Pchum Ben festival. The festival educates younger people on how they should give respect to their relatives. Read about other important Cambodian festivals. 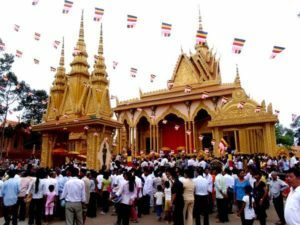 What is Khmer New Year?